The Cost of Fear: The Framing of a Fukushima Report : NPR Public Editor Some listeners said a report on the cost of emotional trauma following the Fukushima disaster underplayed the danger of nuclear power. Science correspondent Richard Harris explains the editorial decisions. Workers are given radiation screenings as they enter the emergency operation center at Tokyo Electric Power Co.'s Fukushima Dai-Ichi nuclear power plant. 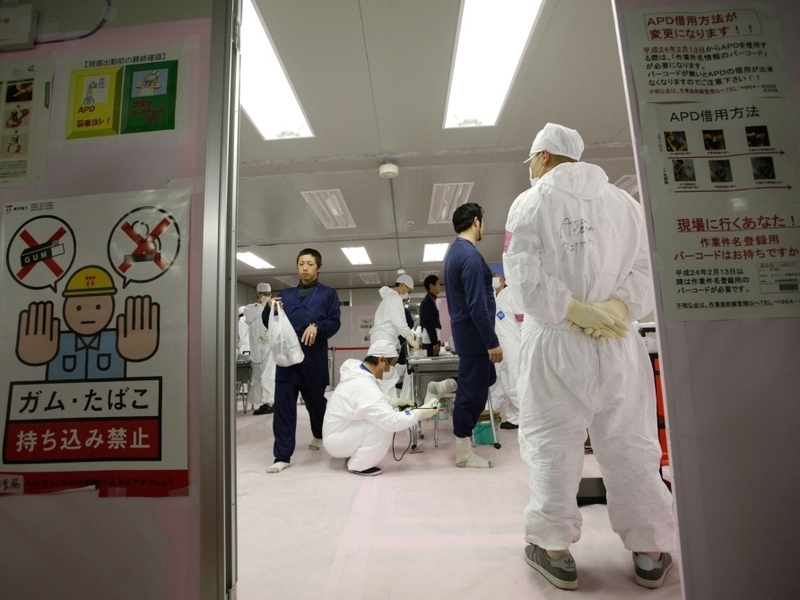 This month marks the one-year anniversary of the Fukushima Daiichi nuclear disaster. We keep learning more about what happened and why. New questions also are raised. As part of NPR's on-going coverage of the situation in Japan, science correspondent Richard Harris reported that the emotional trauma caused by the massive earthquake, tsunami and nuclear reactor meltdowns will likely have a greater negative impact on the population than radiation exposure. The report, in Morning Edition host Steve Inskeep's words, was about "the cost of fear." Some listeners contacted us following the segment to question why Harris would, in their words, "downplay" the dangers radiation exposure had on the public. In particular, Chris McCarthy, a physics professor at San Francisco State University, questioned how Harris could focus his report on the seemingly less-serious problem of trauma in light of a report in the Bulletin of the Atomic Scientists by nuclear expert Frank N. von Hippel, a professor at Princeton, who wrote that "one might expect around 1,000 extra cancer deaths related to the Fukushima Daiichi accident." Nuclear power leaves many of us feeling uncomfortable. You can't see it being generated, and you can't see the deadly radiation it can produce. At the same, a nuclear explosion can be so awesomely destructive. At least these were my feelings when as a reporter for The Philadelphia Inquirer I covered the Three Mile Island nuclear accident in 1979 in Pennsylvania. These same fears seem to drive opponents to nuclear power, as well as a cottage industry of conspiracy theorists. Von Hippel and McCarthy come with considerable credentials, and so we asked Harris to respond. His comments demonstrate the care he took in framing this particular report. As I said at the start of my piece, there's no clear bright line that defines a safe dose of radiation. But the best science shows that smaller doses of radiation – if they are indeed risky — pose risks that are too small to measure. That's exactly the situation at Fukushima. The Japanese government, along with the scientists I spoke to, are using broadly accepted methods of calculating increased cancer risk for a given dose of radiation. Based on people's calculated exposures, they do not find a measurable increase in risk. I was unaware of Frank von Hippel's "guesstimate" (his word) of 1,000 excess cancer cases among the 2 million people within 50 miles of Fukushima. The figure comes from a magazine article he wrote for the Bulletin of the Atomic Scientists (not a peer-reviewed journal). The added risk is not based on the standard dose-risk relationships, but is a comparison with estimates from Chernobyl. Dr. von Hippel figures that since Fukushima released 1/10th the radiation of Chernobyl it should have 1/10th the health effect, but doesn't take into account that the situation on the ground was markedly different in the two places, as I discussed in my story. His article calls on Japan to make more accurate dose estimates. That's in fact been happening, and it's what the scientists in my story based their conclusions upon. Von Hippel's "guesstimate" of 1,000 excess cases of cancer represents an increase of one-tenth of one percent in cancer cases. That's because about 40 percent of the Japanese population gets cancer, so a population of 2 million would expect to see 800,000 cases under ordinary circumstances. One thousand more theoretical cases would not be detectable. In fact, von Hippel's article ends with a discussion of the psychological burden of the accident and says: "Putting the added cancer risks into perspective by showing how small an addition they represent to the risk of cancer from other causes may help to some degree, but psychological counseling and group therapy may be required as well." At a meeting of the National Academy of Sciences in May, the Natural Resources Defense Council estimated that there would be 100 excess cases of cancer among the population of 2 million. That was portrayed as a high-end estimate, because it assumed that everyone in the Fukushima area stood outside during the release events and did not take shelter. I talked to Robert Gale and John Boice about the two workers who got reddening on their legs after exposure to excess radiation. (Contaminated water got into their boots). Gale had examined the workers and said the dose caused a localized reaction but is not high enough to pose an ongoing health risk to the workers. (That issue was trimmed from my story as I edited it down for time). As I said in my Monday evening piece, the nuclear fuel in one reactor has probably melted through its vessel and is now apparently sitting on a concrete-and-steel outer containment building. There is no evidence I know of that says significant radiation is currently making its way into the environment. Anthony Kuhn's reporting dealt with Japan's botched response to the accident. That was beyond the purview of my story on health effects. Attached are some of the listener emails we received. I think that Harris's response speaks for itself. If you have more questions, please let us know. The nuclear accident at Three Mile Island occurred in 1979.